Was wondering what peoples experience is with battery life. I have a hp stream 7 tablet running full windows 10 and I get 8 hours tops. I'm lucky to get 5 with heavy usage. This is unacceptable for me as I am used to 12 to 24 hours with my 8 and 8.1 phones. Looking to,replace the tablet with a Lumia 650. I think it is the full windows not being optimized for mobile that is the issue, not 8.1 vs 10. 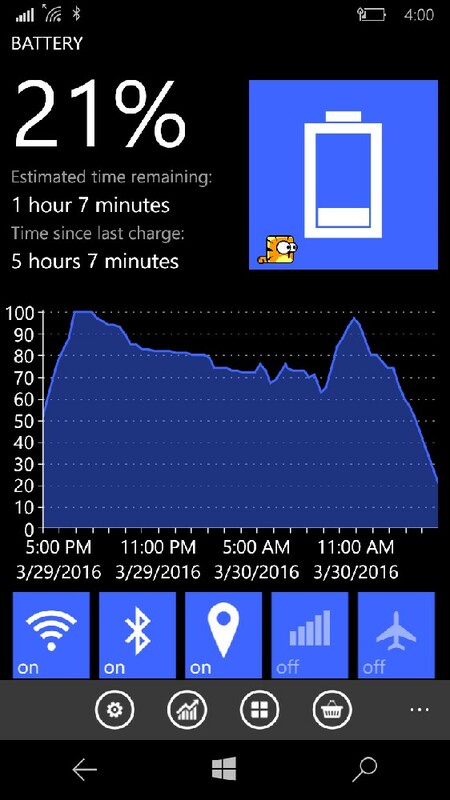 Before I invest in w10m, I want to be sure the battery life is okay. I tried the preview on my old Lumia 520 a few months ago and it was very bad. I thought it was due to the preview and low mah of the battery though. Disappointing. My brother's Lumia 920 ran down and died multiple times in the 2 weeks he tried running Windows 10 (builds 10586.122 and .164). I used my old Lumia 920 for about a week to see if I could duplicate the issue. I couldn't. The battery life was only slightly worse after the upgrade to Windows 10. I've been using a Lumia 640 XL with Windows 10 since November. I never noticed any difference on battery life between Windows 10 and Windows Phone 8.1, and that is over the span of multiple Insider preview builds and now the official Windows 10 mobile launch. Looking for a new midrange phone. Leaving Windows mobile? HTML Signature for Outlook App on Win10 Phone/Mobile?